From ponds to waterfalls, or fountains and bubbling pots, water features can magically transition a landscape from ordinary to extraordinary. 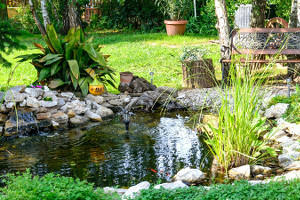 Water features transform landscapes by creating a special focal point, or with soothing background sounds, or by adding movement to a garden. The end result provides increased beauty and ambiance to any outdoor living area and landscape. We welcome the opportunity to discuss and explore with you our many attractive options. Please, give us a call!